Now here's some contextual advertising double stuff for you. 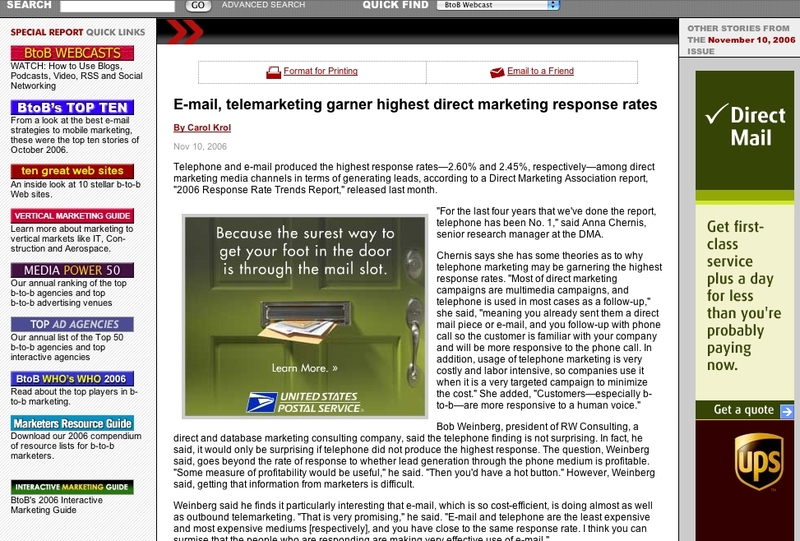 In an article about email and telemarketing touting their superiority over snail mail, not one but two snail mail carrier ads appear on the page: USPS and UPS. Not that there's necessarily anything wrong with an ad appearing next to a story that praises the opposite of what it does but there might be some competitive issues with the ads for competing services appear next to each other. You decide. The USPS 300x250 is awesome. Reasonable expectation: 3x the response (clicks) to the double skyscaper. As in poker so also in advertising in the digital space. The box ad is dominating in evry respect. The article is pure "fill space" compared to the power of the 300x250. Kind of like parsley on your dinner plate...the entree is the ad. Thank you Steve for a superb post and jpeg! It's like the Belgian Postal Services advertising their DM services through bannering in which they ... question the effectiveness of banners compared to DM! You can still find the creative in this post on the These Days blog.